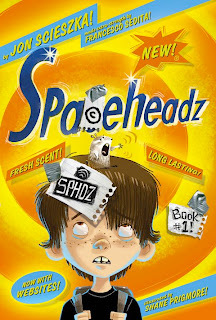 SHANE PRIGMORE: SPACEHEADZ!! Book#1: Ready for Humans! SPACEHEADZ!! Book#1: Ready for Humans! 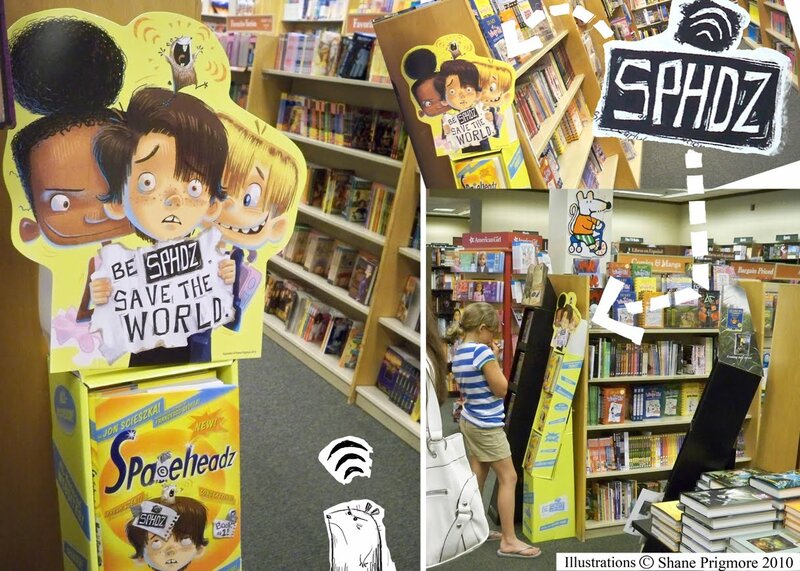 and in book stores everywhere! If you ever wondered why I never have time to update my blog, here it is. This was one heck of a first book to be a part of as I was lucky to work with Simon and Schuster, Jon Scieszka, and Francesco Sedita. Holy Moly! A short while back I received a call out of the blue from Dan Potash and Justin Chanda (Creative powerhouses) at Simon and Schuster asking if I would be interested in illustrating books for them. "Uhhh...Yeah." So they sent me a manuscript for a new book/novel series they had in mind entitled Spaceheadz. I absolutely loved it! The story, the characters, the pop culture craziness, the pace and flow was incredibly inventive and fun. As soon as I read chapter 5B "Fluffy Speaks" I called S&S back and told them that I had to do this series. I get to play with two completely different styles of illustration throughout these books. Each serves their purpose, but I approached the look with what I thought was right for the story,the writing, and the author's vision. Check it out, Read it, Have Fun. This is the first in a 4 book series. Books #2 through #4 are coming soon! 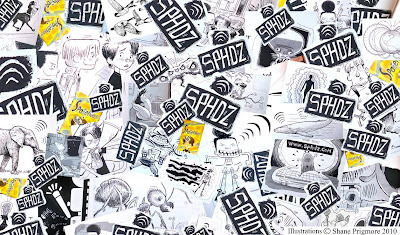 BE SPHDZ! I want to BE SPHDZ!!! Nice dude, seems like a really interesting concept! Just saw the trailer! Can't wait to get my hands on a copy!!! Love your characters! Can't wait to see the book(s)! Hi Shane I adore your artwork asi always! I can´t wait to get it too! greetings from India! your blog is inspiring! Found you through Cartoon Brew. My god your works are amazing. So gritty but with personality. just the way I like it. I'll be sure to purchase this book! As the art looks delicious. Sweet! I can't wait to check it out- Congrats man! Working with Scieszka? Fantastic and congrats. You've reached the top of the children's book mountain! Love the blue rim light! Beautiful illustrations Shane! wow I saw these book in the libraryy!! it was sooo cool!! :D congratulations ;) and nice to writte you! Wow! ,Great information very Superb. Get all your medicines with out prescription with us. i think you are doing a great job, it will be great if you post some General Knowledge MCQ's. Raees 720p HD Movie Download:- Finally guy Raees Movie is released today and we are going to provide you download links for Raees Full HD Movie Download. Even after being clashed with Kaabil Shahrukh Khan Movie Raees is performing many time better. Get Raees MP4 Movie or download torrent. Jolly LLB 2 Movie is finally released on 10th Feb 2017 and it have made a good amount of box office collection. As from the fans side it was predicted to collect 200+ Crores as total profit or earning sum . After seeing Jolly LLB 2 Box Office Collection of 1st, 2nd, 3rd day and total Jolly LLB first week box office collection i think its clear to everyone that Jolly LLB 2 is a big hit movie of 2017. Akshay Kumar will be releasing overall 2 movies in this year and maybe both lies in top 10 earning movies of 2017.
sad status, holi 2017 sms, happy holi status for whatsapp, free recharge tricks, happy holi images, holi 2017 photos, best holi songs, happy holi 2017 images, happy holi quotes, happy holi shayari, Happy Holi 2017, Happy Holi 2017 Messages. also clever post. I definitely enjoyed my first read throughout this post. Have a look at: whatsapp group name. Top 10 beauty parlor in indiathroughout India. I would say that besides being ready for humans, the book will also be very interesting and maybe beneficial. It seems to be a comic book, which i am glad that you showcased. While at that, be sure that you can use Wall Guards to secure your house and ensure minimal damage. Users can use more websites to use the internet anonymously. GO SEE HOW TO TRAIN YOUR DRAGON !!! CORALINE is now on DVD and BLUE-RAY !